There are a ton of reasons you should pick up and walk away from your commitment to your church family. I’ve narrowed it down to the top 5. Be on the look out for these signs….if you see them get out! 1. Someone offended you. At any point that you feel your feelings are hurt you should leave. Make sure you look for the subtle signs that people don’t like you: someone walking by and not saying “hi”, not being invited along with a group, not being thanked for something you did, a point in a sermon that made you feel uncomfortable, someone doesn’t notice that you weren’t at church because of the other hundreds of people in the room. If you’re offended it must be a good enough reason to leave. Go with that emotion. 2. You don’t “feel” like you’re being fed. This is really important. You need to purposely forget that your pastor is moving a large group of people from across a wide spectrum in their faith experience to maturity. Make an effort to avoid other discipleship opportunities like Life Groups and classes. It’s completely understandable that you would blame your pastor for your lack of discipline in feeding yourself the Word during the week. Make it a point to have a view that it’s really all about you instead of investing in helping others around you grow. 3. Your Son or Daughter isn’t happy there. In today’s child centered world this makes sense to leave your church if you’re child says they don’t want to go. What’s great about this one is it gives you an opportunity to model for your kids what you should do when something is not done your way: leave. Besides your child must know best….I mean they are the child. Whatever you do don’t teach them to adapt, appreciate the differences in others or model ongoing faithfulness. Get out before they plant roots. 4. Your area of passion is not being promoted enough. 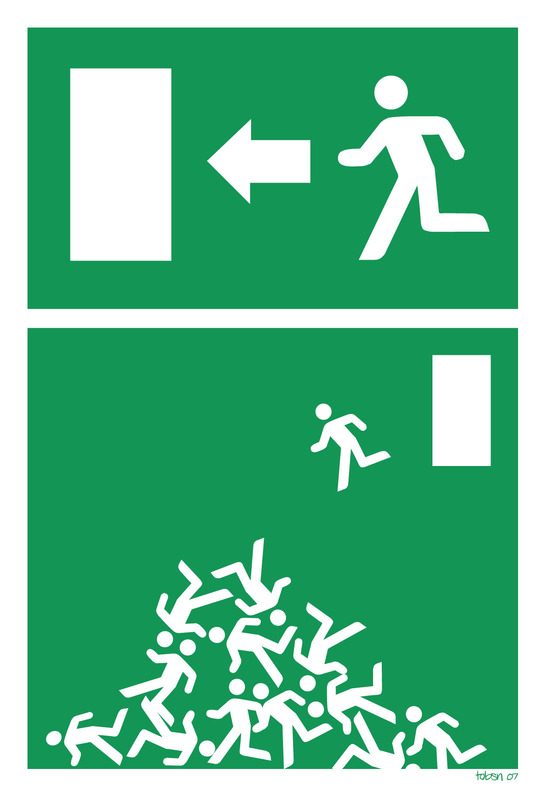 If the leadership team at your church doesn’t promote your area of involvement you should find the nearest exit sign. It’s obvious that the reason the pastor is refusing to do this is because he doesn’t like you and not because he has a million other important plates that need to be spun. Here is your chance to read sign #1 and be offended. 5. You made a mistake and a leader brings accountability. When you committed to follow the pastoral leaders of your church you certainly didn’t mean you wanted them to help you grow by holding you accountable. Who needs to submit? Not you! Don’t be sharpened by the experience or walk through restoration. Why should you when there’s another church down the street that doesn’t know anything about your issues and will welcome you with open arms. What about you? Have any other signs of when you should leave your church? Please share below. Steven, thanks for dropping by! Yes, this is absolutely satire! Hope it made the point! I don’t like the music… should’ve been number one. Nothing is more important than having good music at church.